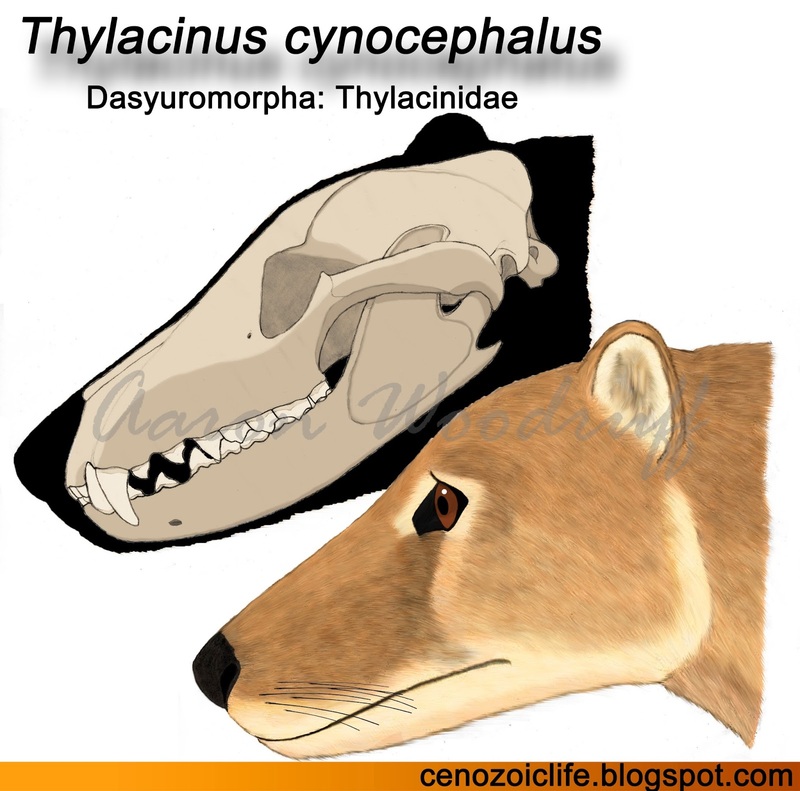 The Tasmanian Thylacine (Thylacinus cynocephalus) was the last survivor of the Thylacinidae, a family of predatory marsupials that first appeared about 25 million years ago. It is well-known as the largest predatory marsupial in recent times and was the unfortunate victim of one of the worst genocidal assaults upon any land mammal. The name Thylacinus is derived from the Latin word thylaco, meaning "pouch" or "sac", and the Greek cynos, meaning "dog". The species name is a combination of the Greek cynos and kephale, the latter meaning "head", referencing the superficially fox or jackal-like head of the animal. This species is also commonly referred to as the "Tasmanian Tiger" for the vertical stripes running down its back. Tasmanian Thylacines roamed freely across mainland Australia, Tasmania, and New Guinea for at least 4 million years, making it among the oldest mammalian species in the world. They survived into historic times on the island of Tasmania, and became extinct there due to human persecution. Remnant populations of it have been rumored to still exist on mainland Australia, but these are unsubstantiated. The preferred habitat for this species was open forest and woodland as well as the drier savannas and scrublands that once dominated northern, eastern, and southern Australia. At first glance one might mistake the Tasmanian Thylacine for a type of wild dog. Although its head is somewhat reminiscent of that of a dog, its body was more cat-like. Its body was long, muscular, and flexible with sturdy limbs and semi-plantigrade feet. Its tail was long, stiff, and muscular to keep the animal balanced while running and leaping. These were stalk-and-ambush predators, unable to run fast for long periods like a dog. Its forelimbs and paws were built to seize and hold its prey after a surprise attack. Its most distinctive feature was the row of vertical stripes down its back. Thylacines also had the ability to prop themselves up on their hindfeet and tail in a manner similar to a kangaroo, a posture that enabled them to peer over tall grass or other obstacles when searching for prey. They have even been reported to hop in a kangaroo-like hop for short distances. According to eyewitness accounts, Tasmanian Thylacines were solitary while hunting although small family groups may have shared the same home range. Breeding could apparently take place at anytime of the year with peak breeding seasons in winter and spring. Females could produce up to 4 pups at a time. They were primarily nocturnal or crepuscular. 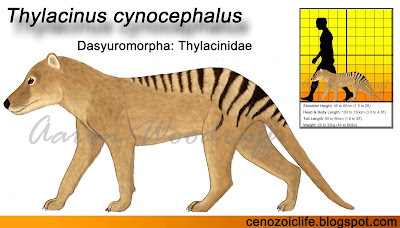 Tasmanian Thylacines were mid-sized predators that specialized in taking prey smaller than themselves. Detailed biomechanical analysis of the animal's skull reveals that its narrow face was ill-suited to handle relatively large prey items on a regular basis, thus limiting it to animals its own size or smaller. Furthermore, the anatomy of its limbs is reminiscent to those of modern ambush hunters like cats and civets. In this regard, the Maned Wolf (Chrysocyon brachyurus) of South America, another small-prey specialist which hunts by stalk-and-ambush, is perhaps the best modern ecological analogue for the Tasmanian Thylacine. 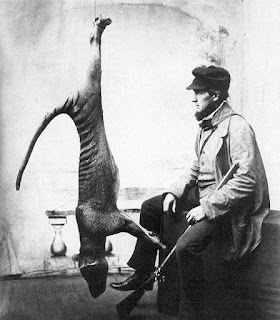 The regular prey menu of the Tasmanian Thylacine included reptiles, birds, echidnas, possums, bandicoots, and wallabies up to about 10kg. Although its sense of smell was acute, its senses of sight and hearing were more important to it during a hunt. Once prey was detected, it would stalk it in a cat-like fashion before springing upon it once within range. Larger prey was dispatched with a bite to the back of the head while smaller prey would simply be pinned down and crushed in its jaws. Specializing in smaller prey in this manner means that the Tasmanian Thylacines would not have competed with the larger Australian predators of the Pleistocene such as Megalania (Varanus prisca), Marsupial Lion (Thylacoleo carnifex), or the Powerful Thylacine (Thylacinus potens), although its prey selection did overlap with those of Australia's smaller predators like Tasmanian Devils (Sarcophilus harrisii) and Spotted-tailed Quolls (Dasyurus maculatus). Thylacine numbers appear to have declined sharply between 77,000 and 69,000 years ago, a date that roughly corresponds to the eruption of the Toba supervolcano on Sumatra. An event which led to mass megafauna die-offs elsewhere in the world and is the likely cause for the genetic bottlenecks found in many of today's larger mammals. Nonetheless, the highly adaptable Thylacine persisted and coexisted peacefully alongside humans which arrived there about 50,000 years ago. The animal is even represented prominently in Australian rock art dating back thousands of years. After the dingo was introduced to Australia around 4,000 years ago, Thylacines suffered another decline under the pressure of this new competitor. Because Dingos tend to target the larger kangaroos and wallabies, however, there would have been minimal dietary overlap and Thylacines could still thrive on the mainland. Nonetheless, Thylacines suffered from low genetic diversity and their mainland population had been steadily declining over the last ~100,000 years, most likely due to disease. The island of Tasmania, which had been connected to the Australia until 19,000 years ago, eventually became a stronghold for this species and it lived as the largest land predator of the island. 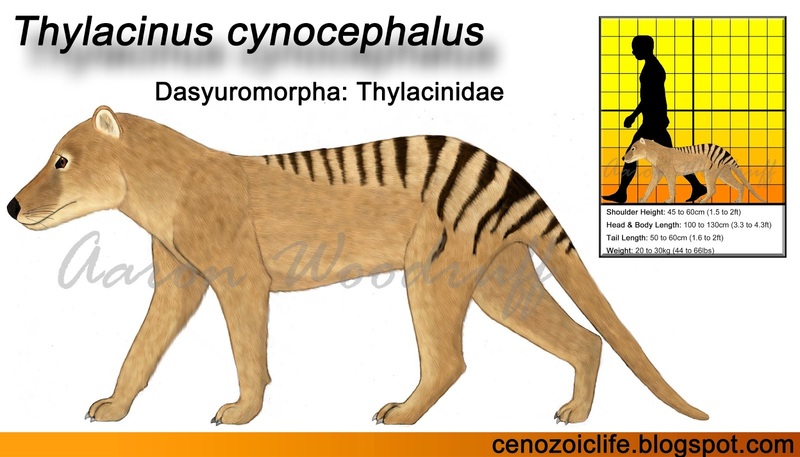 The arrival of Europeans proved to be the final nail in the coffin for Tasmanian Thylacines. Not long after livestock were introduced to the island, a mass genocide of this species soon followed. Eventually, bounties were placed on this species by the government and the animals suffered a steep drop in population. Despite this obvious decline, it was not given official protection by the Tasmanian government until two months before the last known individual died at Hobart Zoo on September 7, 1936. 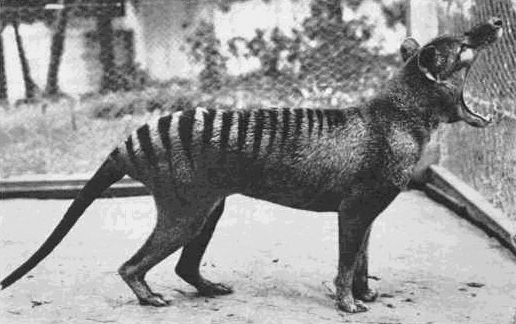 Throughout mainland Australia, multiple eyewitnesses going back since European occupation first began have claimed to have seen living Thylacines. Based on these eyewitness accounts it seems possible that Australia could still support a population of Thylacines which have managed to remain elusive, unlike their counterparts on Tasmania. A few anecdotal accounts even exist of Thylacines being shipped from Tasmania and being released on mainland Australia prior to their extirpation. Other reports from New Guinea reveal that the animals may still exist in the dense forests of the island which have remained largely unexplored by non-native peoples. Local tribes speak of a dog-like animal with a thick tail and a mouth that can open its mouth extremely wide. Of course, definitive evidence is needed to confirm these claims (e.g. a fresh carcasses, live specimens, or clear video footage), but it would not be the first time a supposedly extinct animal was found to still persist. If still present, their long-term survival would hinge on the presence of viable populations and undisturbed habitat.